Ambrosio Casanova of Madison won $40,000 playing Cash Splash from the Nebraska Lottery. 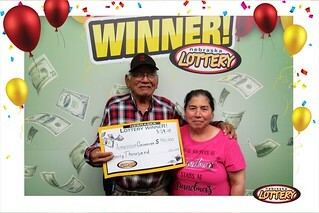 Casanova purchased his winning ticket from the Hy-Vee Food Store at 2107 Taylor Ave. in Norfolk. While claiming his prize, Casanova said he’d be spending his winnings to pay off his truck. As $5 Scratch game, Cash Splash offers players the chance to win prizes from $5 to $40,000. The chances of winning $40,000 are 1 in 198,000 while the overall odds of winning any prize are 1 in 3.79.